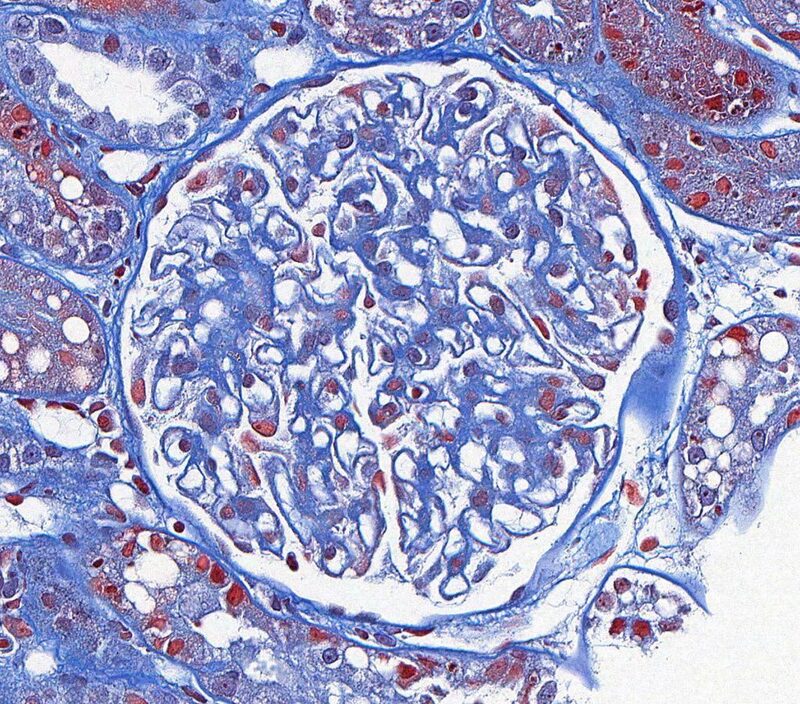 Membranous glomerulonephropathy (MGN) is an immune-complex mediated disease wherein immune complexes are deposited on the abluminal (subepithelial) side of the glomerular basement membrane (GBM). Immune complex deposits are composed of immunoglobulin (usually IgG) and antigen. The source of the antigen is often unknown and could be native or exogenous. Immune complex deposits activate the complement system. Complement components (e.g. C3) can be identified with IF. 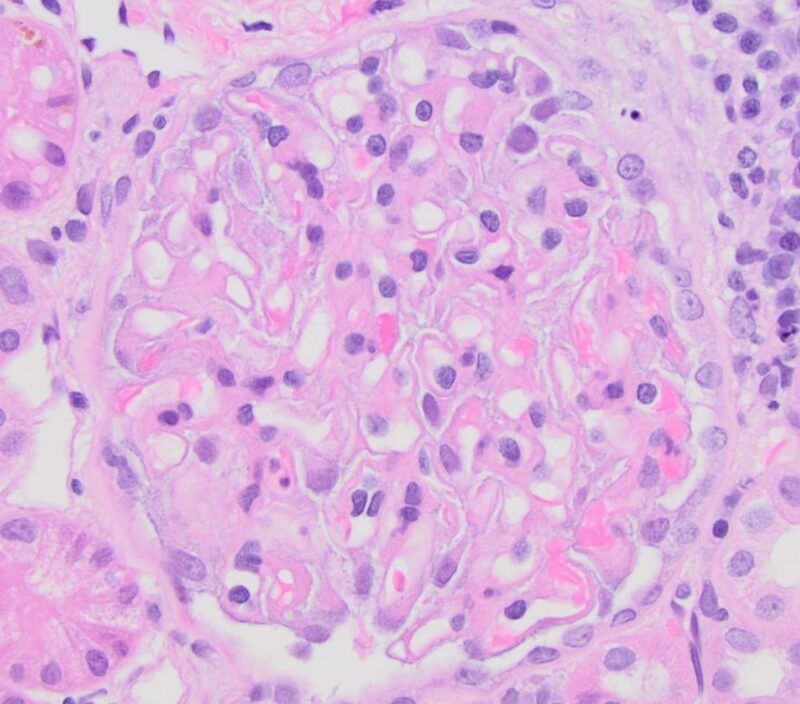 Histologic appearance – Glomeruli are usually normocellular. In early stages, the capillary walls are histologically normal. In later stages, GBM remodeling occurs, demonstrated by the presence of spikes on the abluminal surface and / or holes within a thickened capillary wall. With LM, the GBM remodeling is best visualized with JMS. Regularly spaced subepithelial red (fuchsinophilic) nodular deposits are suggestive of immune complex deposits with MT. Mesangial hypercellularity is minimal to mild while endocapillary hypercellularity should be absent to minimal. 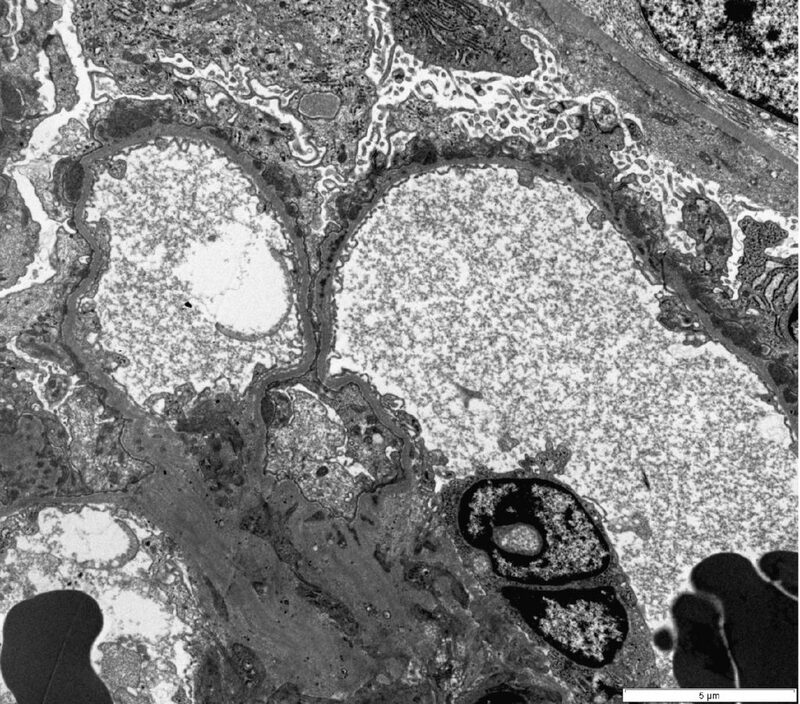 TEM and IF are used to identify the presence of immune complex deposits and are invaluable in identifying early cases of MGN when GBM remodeling is subtle or absent on LM. Foot process effacement and other non-specific lesions of podocyte injury are also usually present. MGN can be staged based on the following features. The duration of each stage is unknown and some cases might have glomeruli at various stages, likely due to episodic immune complex deposition. Early MGN: GBM has a normal contour and thickness on LM; deposits might be visible with MT. TEM reveals deposits but GBM remodeling is absent or minimal (limited to small scattered spikes). Late MGN: GBM thickening and remodeling (spikes and holes) can be seen with LM. Red nodular deposits might be visible with MT. On TEM, prominent spikes of GBM are in between electron dense deposits, and some deposits are completely encircled by GBM. Advanced MGN: LM evidence of marked GBM remodeling, with holes present in severely thickened capillary walls. 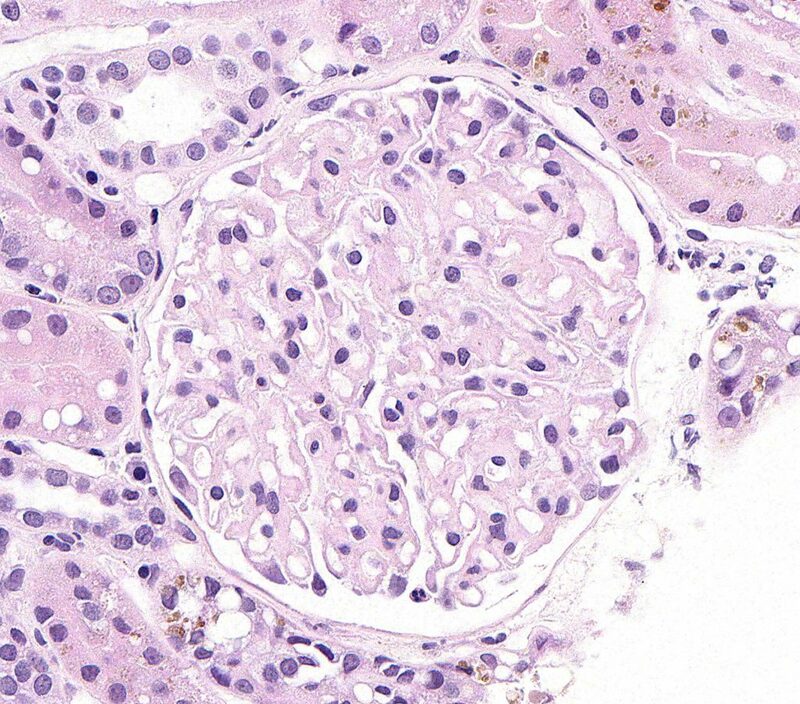 There is also secondary glomerulosclerosis due to podocyte injury and loss. TEM might reveal evidence of dissolution of the deposits. 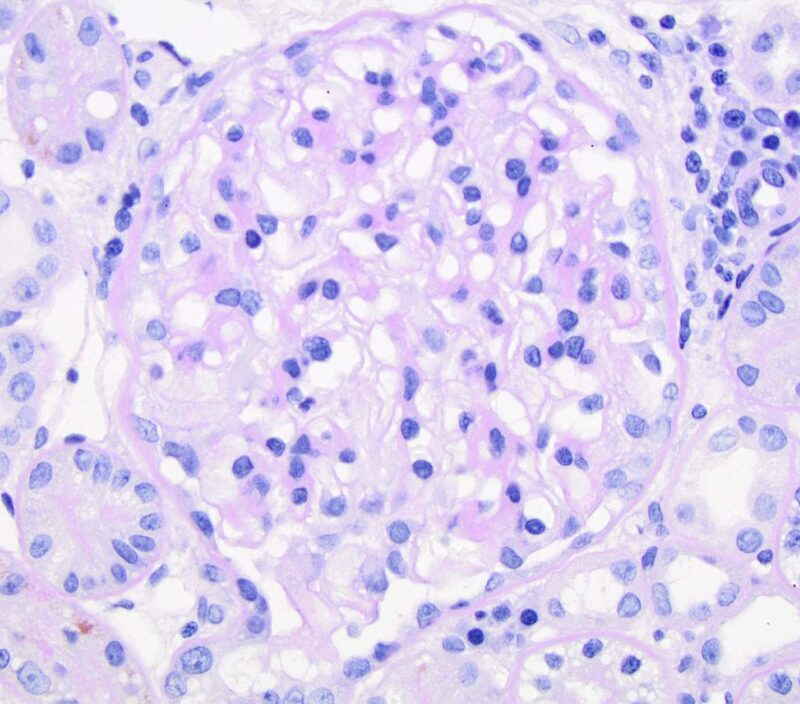 Initial sign is typically moderate to marked proteinuria, often with hypoalbuminemia. Dogs with membranous GN nearly always present with UPC >2. Azotemia develops with sclerosis and nephron loss due to persistence/progression of disease. With extensive advanced lesions, severity of proteinuria and hypoalbuminemia might decrease. Other common clinical findings include low antithrombin activity, hypertension, hypercholesterolemia, and edema/ascites. MGN is associated with infections, such as Leishmaniasis and Lyme nephritis. Dogs <1 year of age are unlikely to have MGN. No breed predisposition is currently recognized. 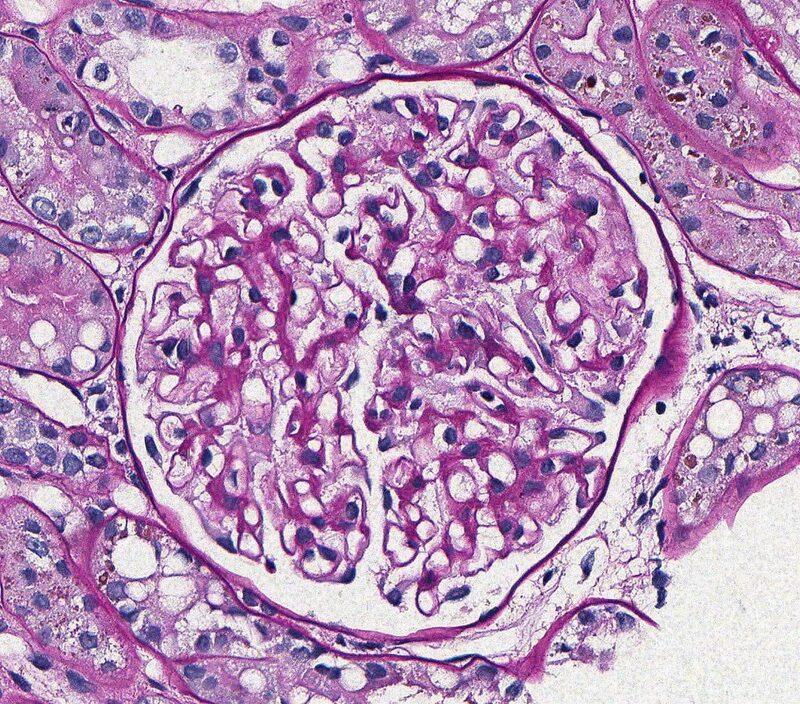 EARLY MEMBRANOUS GLOMERULONEPHROPATHY: The capillary wall appears normal to mildly thickened. GBM remodeling is absent or minimal. Fuchsinophilic deposits might be identified with MT. 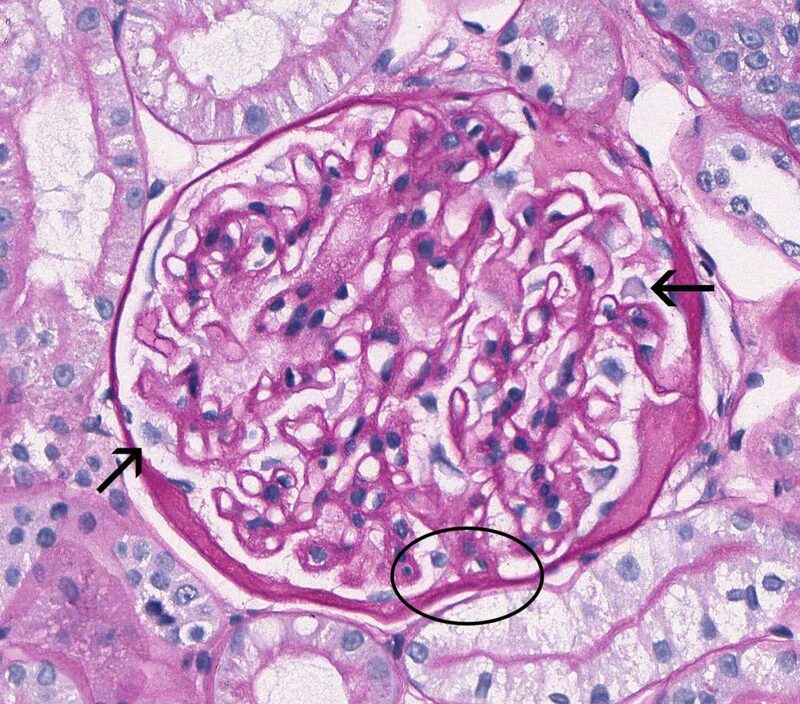 FIG.1A (HE): The glomerulus is normocellular. Some capillary walls appear slightly thickened; however, capillary wall thickness is better evaluated with PAS because the podocyte cytoplasm and GBM stain differently with this method. FIG.1B (PAS): The GBM, which is best evaluated in the peripheral capillary loops, is thin and has a smooth contour. FIG.1C (MT): Fuchsinophilic (red) deposits are not observed. FIG.1D (JMS): Capillary walls are of normal thickness; remodeling is not observed. There are pinpoint lucent foci on the en face surfaces of a few capillary walls (circled). FIG.2A (HE): Podocytes are hypertrophied. 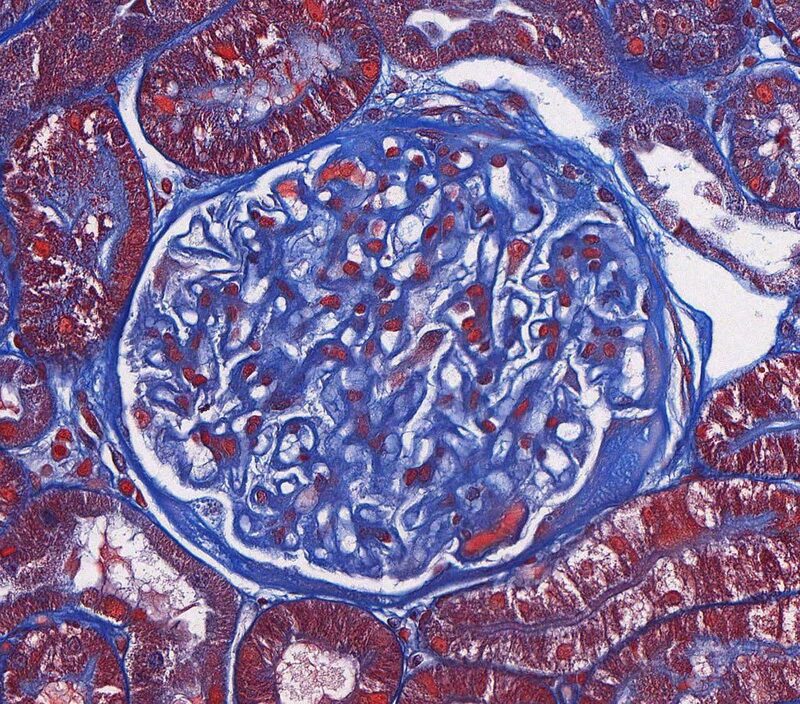 The glomerulus is normocellular. 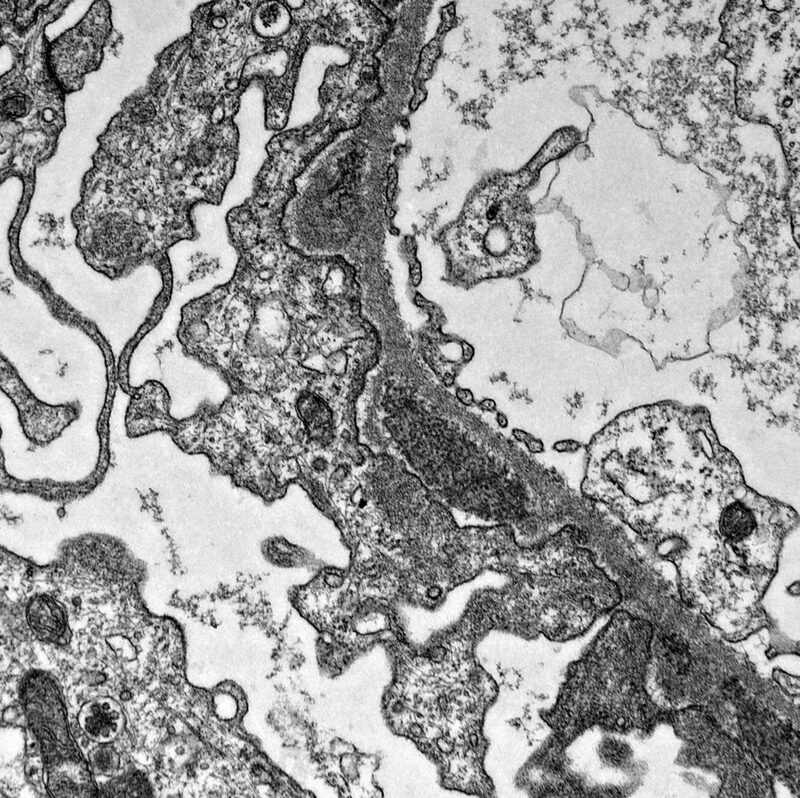 FIG.2B (PAS): GBM are mildly thickened, and the glomerulus is normocellular. 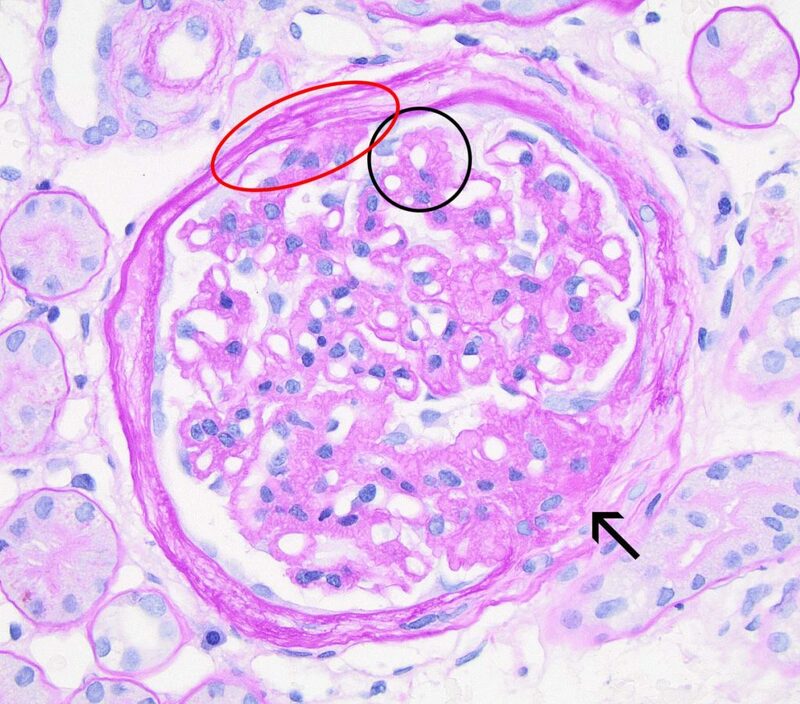 FIG.2C (MT): There are many capillary loops with discrete, small, fuchsinophilic nodules, which are consistent with immune deposits (circled). FIG.2D (JMS): The GBM appears normal. There is no evidence of GBM remodeling. 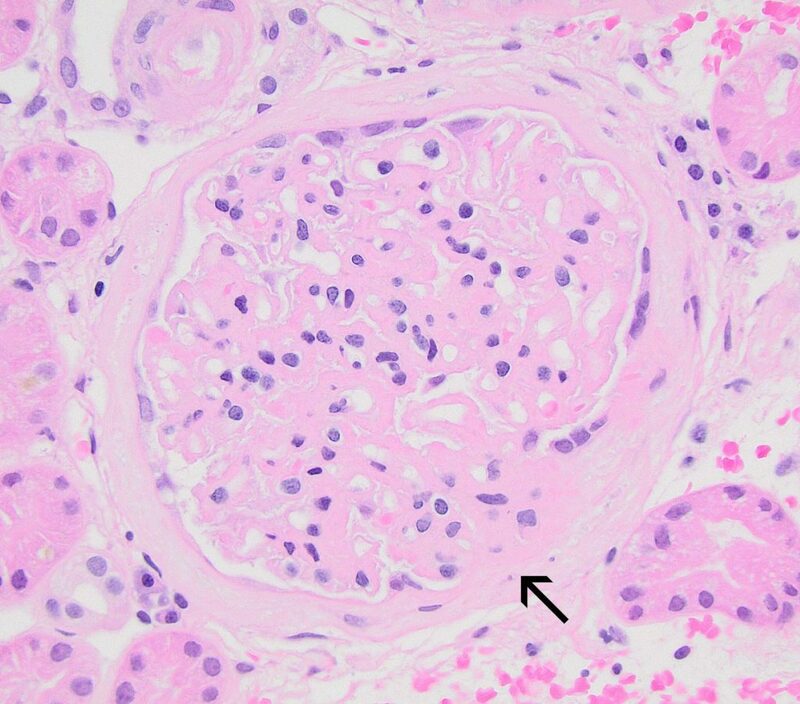 LATE MEMBRANOUS GLOMERULONEPHROPATHY: GBM remodeling is easily observed with LM. 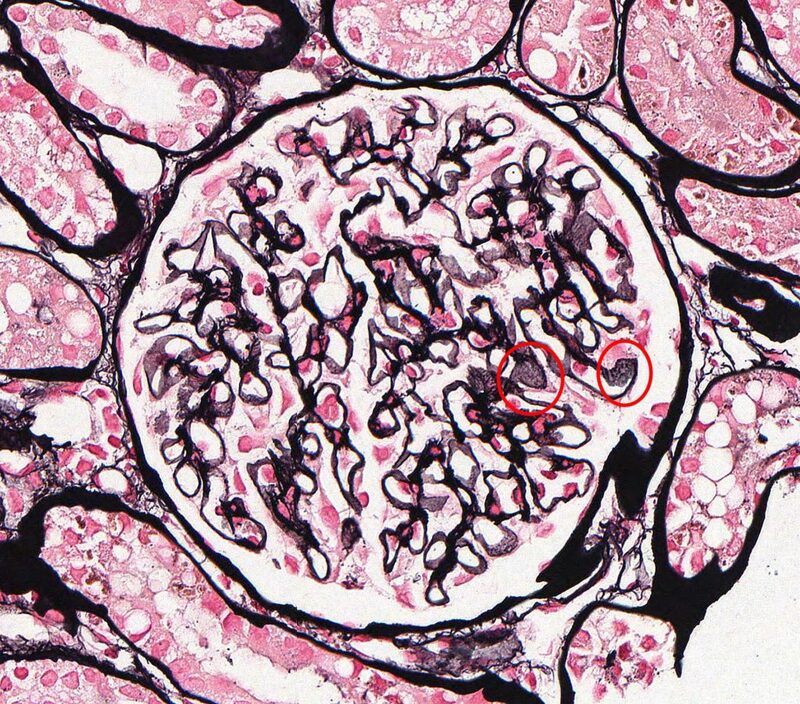 FIG.3A (HE): Most glomeruli have mild to moderately thickened capillary walls. 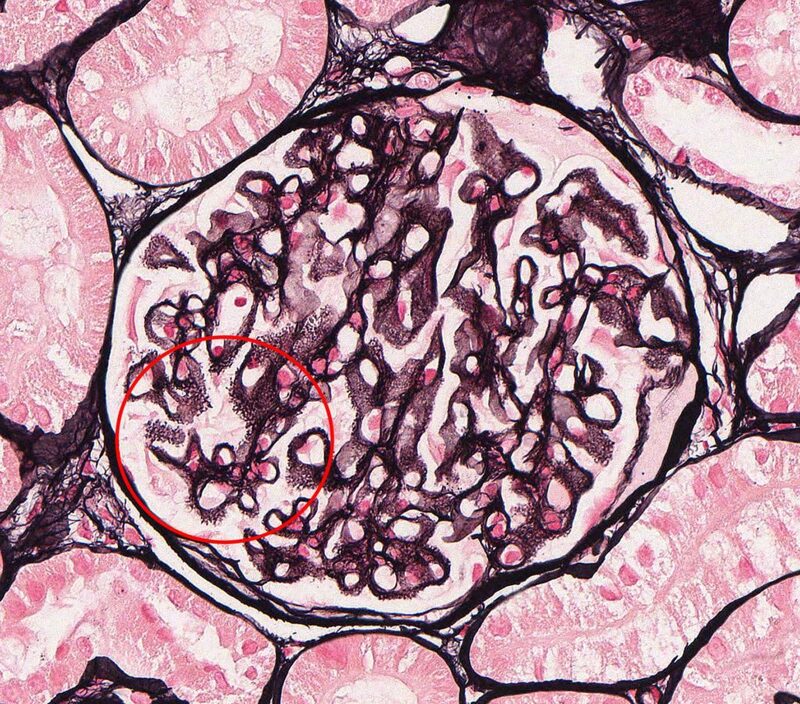 In this glomerulus, there is also evidence of diffuse podocyte hypertrophy (circled) and a thickened Bowman’s capsule. 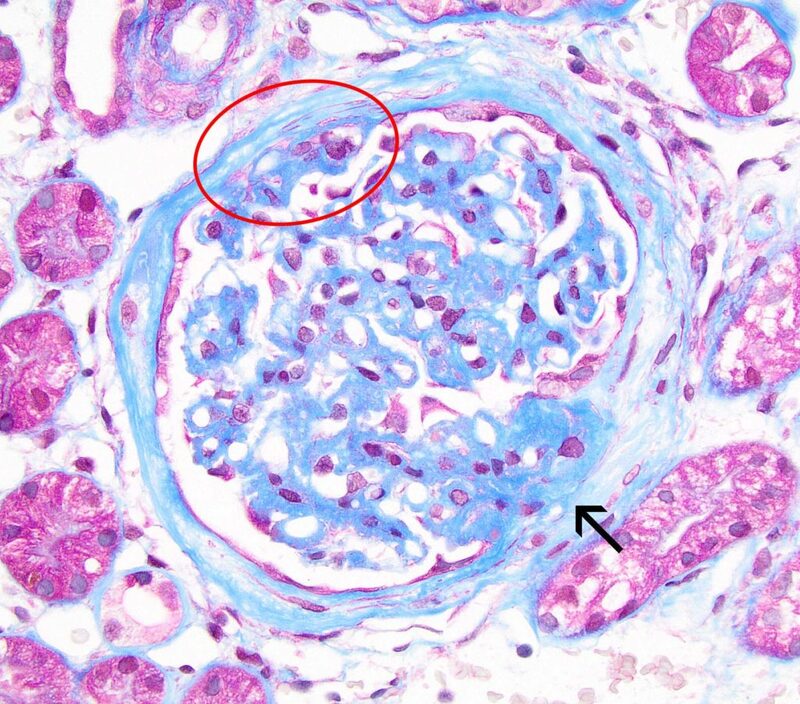 FIG.3B (PAS): Glomeruli have mildly to moderately thickened capillary walls, and podocytes are often hypertrophic (arrow). There is a focal synechia (circled). 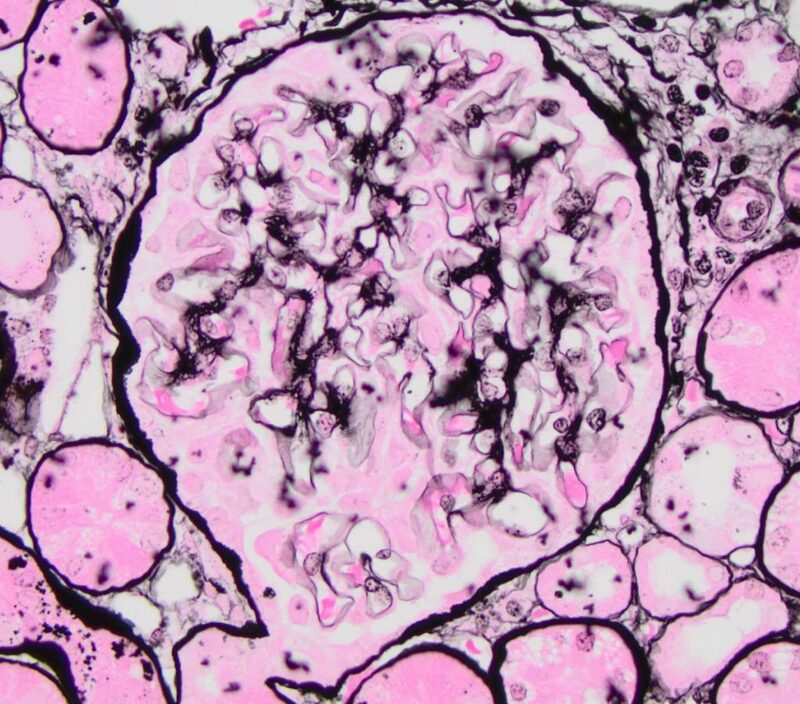 Bowman’s capsule basement membrane is expanded by insudated proteinaceous fluid (hyalinosis). Capillary lumens are open and endocapillary hypercellularity is not a feature. 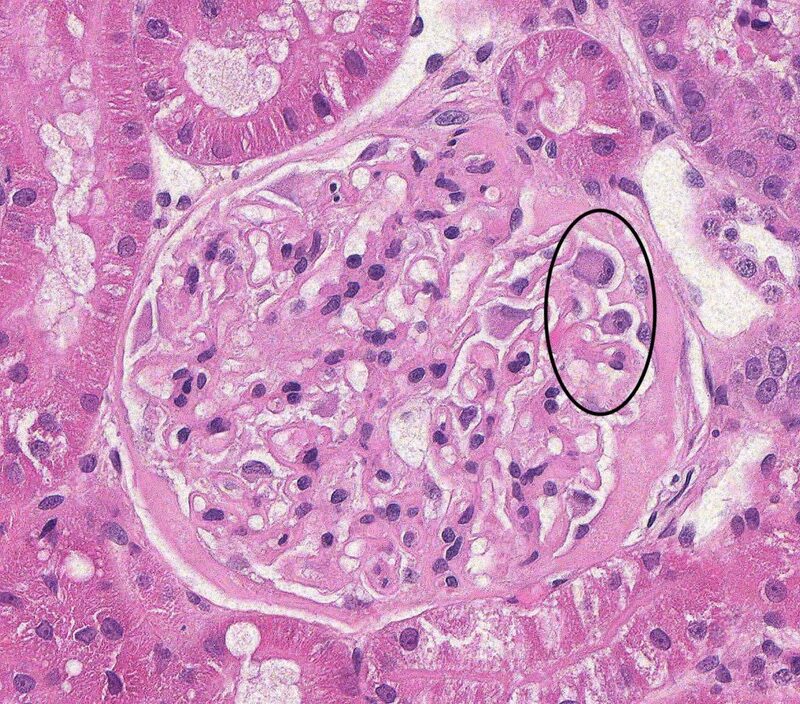 FIG.3C (MT): Glomeruli have mild to moderately thickened capillary walls. 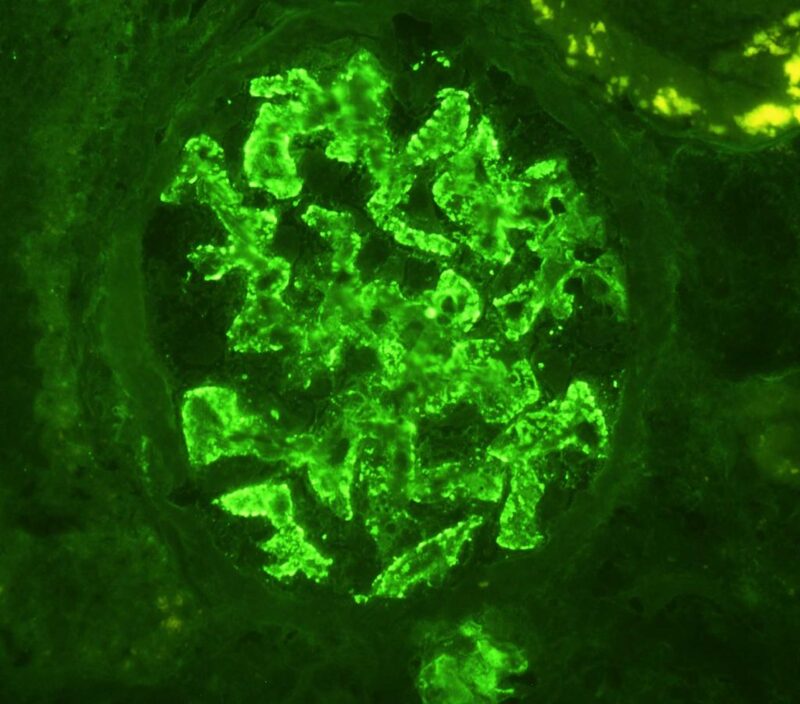 Fuchsinophilic deposits are not evident in this glomerulus but they might be present in other cases of late MGN. The thickened Bowman’s capsule has a focus of pale peach hyalinosis. FIG.3D (JMS): In the late stage of MGN, there are frequent spike-like projections and holes, indicative of GBM remodeling (circled). FIG.4A (HE): There is diffuse, marked thickening of the capillary walls. A broad synechia is present (arrow). There is thickening and splitting of Bowman’s capsule basement membrane, both of which are non-specific lesions that can be seen with synechiae. FIG.4B (PAS): There is global remodeling of the GBM (black circle), resulting in marked irregular nodularity of the abluminal (subepithelial surface). Synechia (red circle) and segmental sclerosis with associated synechia (arrow) are frequent at this stage. FIG.4C (MT): There is global marked remodeling of the GBM, predominantly affecting the abluminal (subepithelial surface). Synechia (red circle) and segmental sclerosis with associated synechia (arrow) are frequent at this stage. 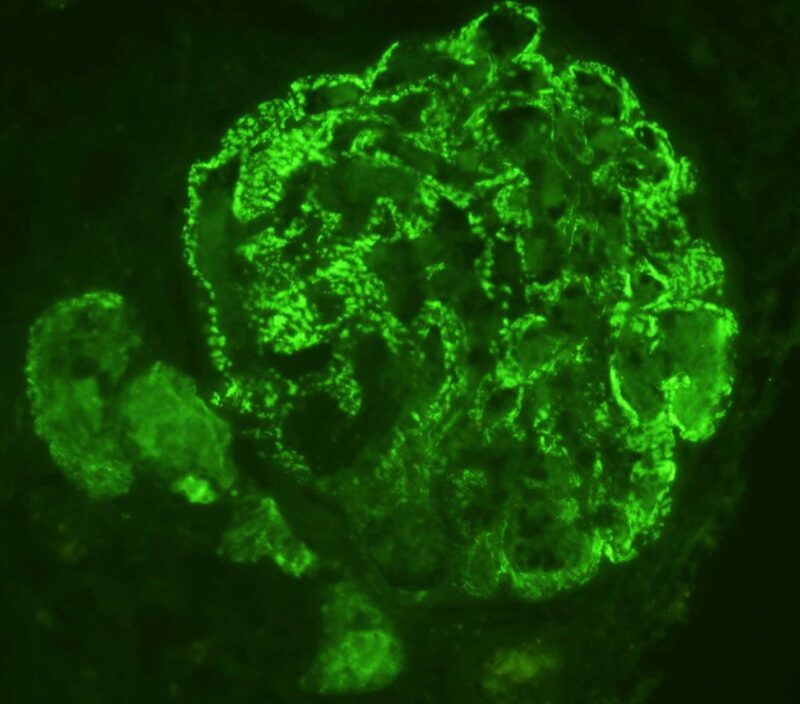 Fuchsinophilic deposits are not evident in this glomerulus but might be seen in other cases of Late MGN. 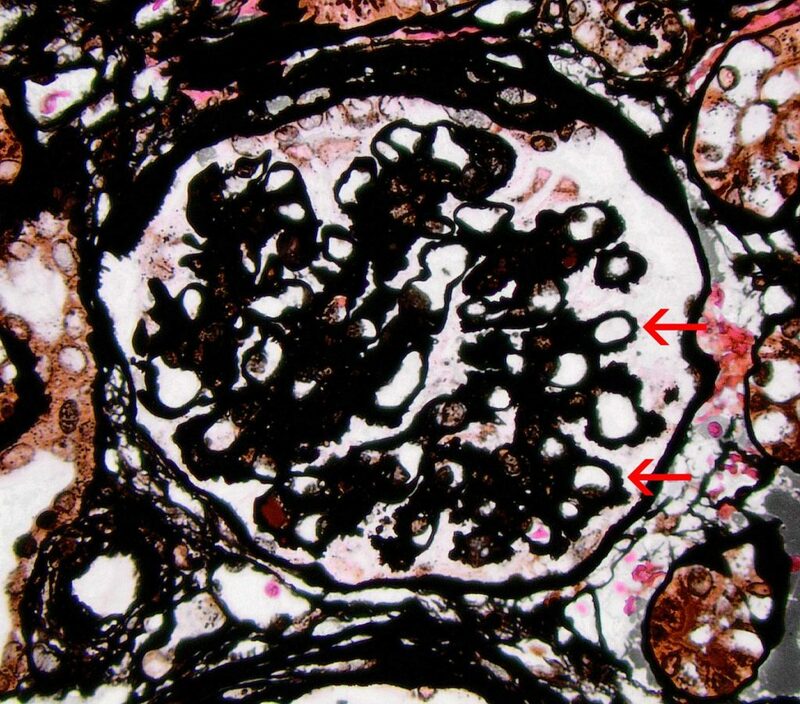 FIG.4D (JMS): The silver stain demonstrates striking knobby to spike-like projections on the subepithelial surface (arrows). FIG. 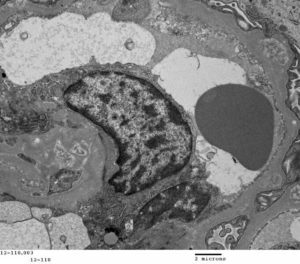 5A (TEM): Numerous electron dense deposits are present on the subepithelial surface of the capillary loops. FIG. 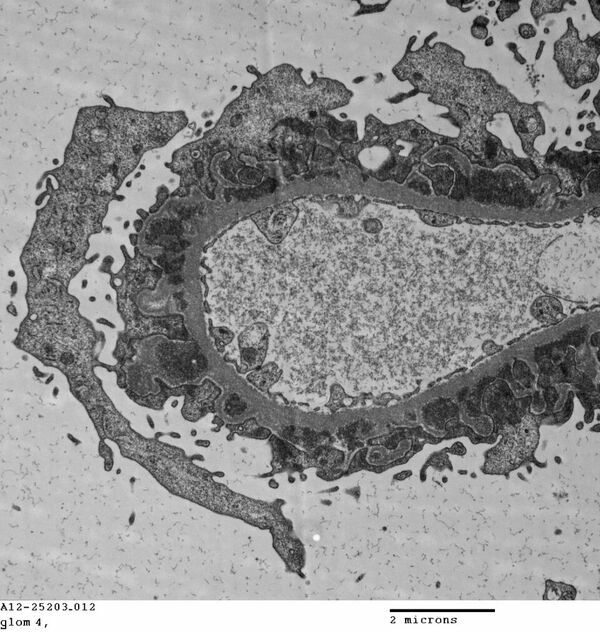 5B (TEM): Numerous electron dense deposits are present on the subepithelial surface of the capillary loops and there is minimal remodeling of the GBM. FIG. 5C (TEM): There are small spikes of GBM at each side of the electron dense deposit. Podocyte foot processes are globally effaced. FIG. 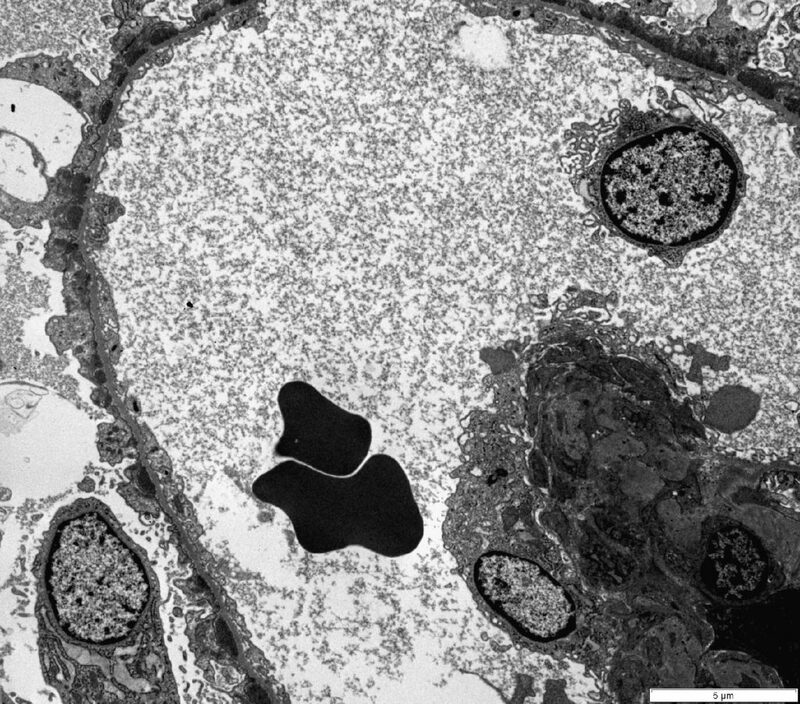 5E (TEM): Many large electron dense deposits are along the subepithelial surface of the capillary wall. Podocyte foot processes are globally effaced and there is microvillus transformation of the cytoplasm (outlined with red dotted line). FIG. 5F (TEM): Colorized version of above TEM image. (Yellow: endothelial cell, Green: GBM, Pink: podocyte, deposits are uncolored). FIG. 5G (TEM): Late stage MGN with numerous encircled electron dense deposits. Podocyte foot processes are globally effaced. The capillary lumen is open and the endothelial cell maintains its fenestrations. FIG.5H (TEM) Colorized version of above TEM image. (Yellow: endothelial cell, Green: GBM, Pink: podocyte, deposits are uncolored). 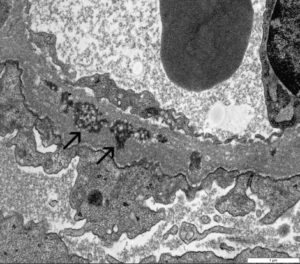 FIG.5I (TEM) Electron dense deposits are encircled by new GBM material and most deposits have a mottled appearance, indicative of resorption (arrows). FIG.5K (TEM) Colorized version of above TEM image. (Yellow: endothelial cell, Green: GBM, Pink: podocyte, reabsorbed deposits are uncolored). 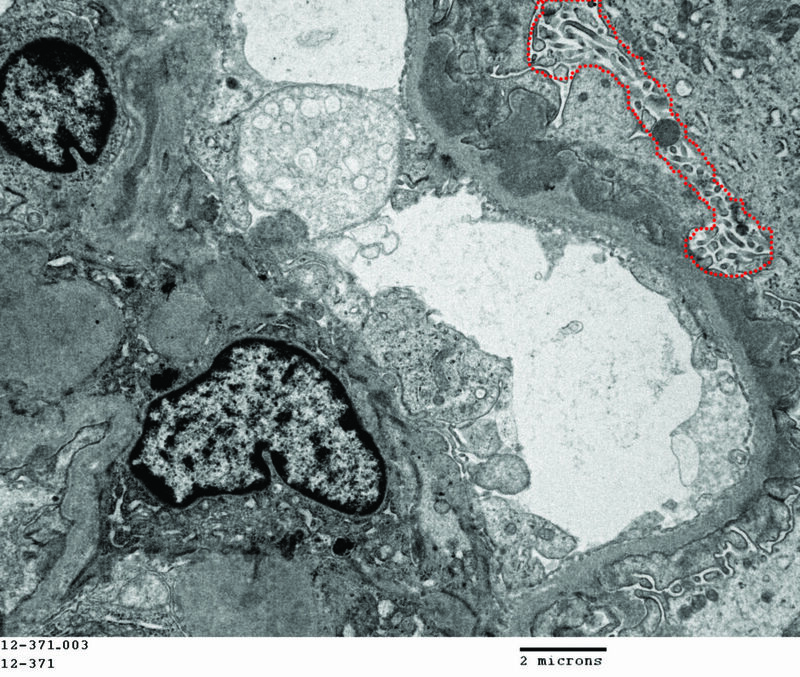 FIG.5L (IF for IgG): There is strong granular labeling along capillary loops. FIG.5M (IF for LLC): There is strong granular labeling along capillary loops. 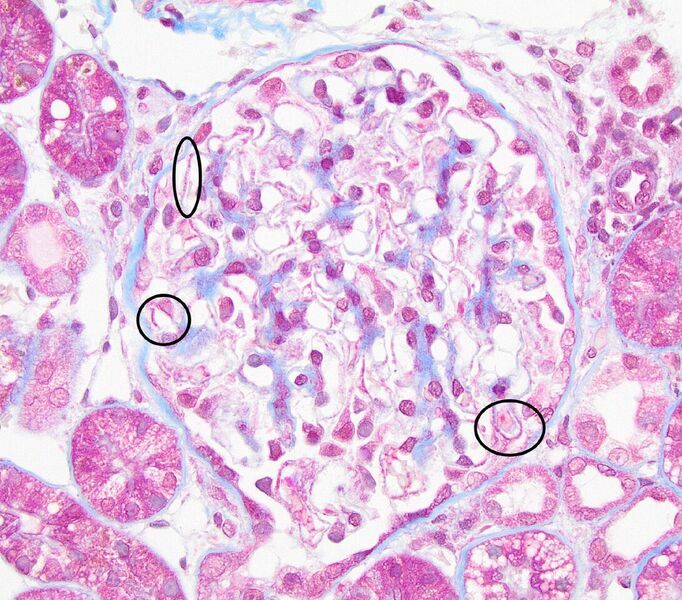 FIG.6 (Comparison panel of JMS): Glomeruli with early (A), late (B), and advanced (C) GBM remodeling demonstrated by subepithelial spikes and holes on silver stain. These JMS stains are the same images as above (Figures 2D, 3D and 4D). GBM remodeling such as subepithelial spikes and holes (best visualized with silver stain) with or without fuchsinophilic deposits. Presence of subepithelial immune complex deposits with MT (fuchsinophilic nodules). Early MGN can have minimal lesions on LM.